Bayern Munich ended this year's Bundesliga campaign ten points ahead of Dortmund at the top of the table, conceding just 17 goals throughout the season. They are unbeaten in 11 of their last 12 games in all competition; lost only one game – to Atletico Madrid in the Champions League semifinal. Mario Gotze has broken a rib and is out of the final. Javi Martinez and Xabi Alonso have recovered from minor injuries in time to make the trip to Berlin, meaning that Arjen Robben and Holger Badstuber are the only other sidelined players. In defense, Joshua Kimmich could get the nod over Medhi Benatia as Javi Martinez is in doubt. Robert Lewandowski is expected to lead the line with Frank Ribery, Douglas Coasta, Arturo Vidal and Thomas Muller behind him. Kingsley Coman is the first option on the flanks. Borussia Dortmund won 24 and lost just four of their 34 league fixtures this season and their 78 points made them the best runners-up in the history of the German league. It would have been enough to win the Meisterschale in 47 of the last 52 seasons. Furthermore, they were the highest scoring team in the Bundesliga with 82 goals. Thomas Tuchel is expected to play his usual 4-3-3 formation with Mkhitaryan, Aubemayang and Marko Reus up front.Gonzalo Castro and Shinji Kagawa should start in front of Julian Weigl in midfield. Defenders Neven Subotic and Joo-Ho Park as well as midfield maestro Ilkay Gundogan will miss the game with various injuries. Mats Hummels will be playing his final game before becoming the third Borussia Dortmund star to join Bayern in the last three years, after Mario Goetze and Robert Lewandowski. 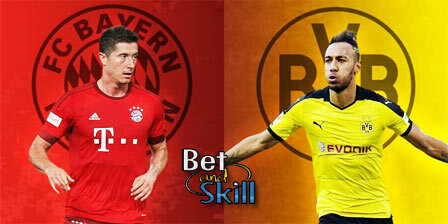 Bayern Munich are unbeaten in their last 5 games against Borussia Dortmund (W3 D2). The most recent meeting between the two sides ended in a 0-0 draw, while the reverse match saw Bayern hammering BVB 5-1 in October with Robert Lewandowski scoring an incredible four goals in nine minutes. BAYERN MUNICH (4-1-4-1): Neuer – Alaba, Kimmich, Boateng, Lahm – Xabi Alonso – Ribery, Vidal, Douglas Costa, Muller – Lewandowski. DORTMUND (4-3-3): Burki – Schmelzer, Hummels, Piszczek, Sokratis – Kagawa, Weigl, Castro - Mkhitaryan, Aubemayang, Reus. "Bayern Munich v Dortmund predictions, betting tips, lineups and odds (DFB Pokal Final - 21.5.2016)"